4 Web Host Review 2019: Is 4 Web Host a Good Hosting? Since 2003, 4 Web Host has extended its hosting solutions to Australia and many other countries, including the U.S. and the U.K. They have also invested heavily in creating powerful data centers in several locations across the globe to offer their customers the best possible hosting services for their websites. 4 Web Host is an Australian website hosting company founded in 2003. Its hosting solutions include Cloud web hosting, VPS, and Dedicated Servers. In addition to Australia, 4 Web Host has a notable presence in the U.S. and the U.K. The hosting provider’s website is available in English, French, Spanish, and Portuguese. 4 Web Host markets itself as a true cloud platform. The hosting company offers their customers both manual and automatic daily data backup solutions that allow users to restore their website any time following a data loss event. 4 Web Host uses Site Control Panel. This control panel is easy to use and has an array of tools to help webmasters transform ideas into functional websites, including over 800 free web themes that you can install with ease. Users who subscribe to this vendor’s Linux hosting solutions enjoy noteworthy scalability; they get to switch from one plan to another with little effort. 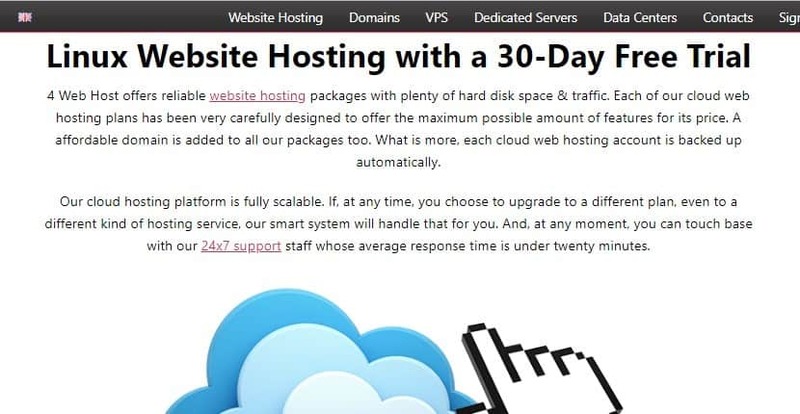 While 4 Web Host hosting solutions seem to have pretty standard pricing, the long list of features included, most of them unlimited, make these solutions extremely budget-friendly. 4 Web Host offers a 99.9% network uptime guarantee regardless of the data center you choose, however, they do not have a refund policy in the event that the server availability falls below 99.9%. They have a 30-day money-back guarantee and their cloud hosting plans include a 30-day trial, free of charge. All of their cloud web hosting plans come with a free domain, as well. The hosting company has made available to their customers several ways to contact their support team, which are available 24/7. This includes email, phone, live chat, ticketing, and a website contact form. The support phone numbers include a U.S. toll free phone number, an international phone number, and local phone numbers for customers in the U.K. and Australia. The 4 Web Host support team has an average response time of 20 minutes. While they have a knowledge base as well, it is only accessible via its Site Control Panel to people who have already bought a hosting plan from them. The Site Control Panel also includes hosting video tutorials and an FAQ section. The 4 Web Host offerings of unlimited features in most of its hosting packages make its hosting solutions some of the most attractive in the market for a business of any size. Check out 4 Web Host’s web hosting options today! Wondering how 4 Web Host stacks up against other Web Hosting companies? Enter any other Web Hosting company and we will give you a side-by-side comparison.